Pyreis legitimately one of the most beautiful games I’ve ever played. Visually, audibly – maybe mechanically, even. So, it might come as a surprise to hear that I had a hard time finding what to say about it. Well: it’s good. Naturally, I’m supposed to provide my reasoning, but… I suppose, it wouldn’t suffice to say it’s self-evident? I was so taken by Pyre that I had to take a step back and really think about it. Once I did, I ended up finding a great deal to say about Supergiant Games’ new release. Let’s start from the skin and work our way in. Pyre is crisp to the eye: smooth animations, a vivid palette and a painterly style of illustration that helps give each character personality and vivacity. The aesthetic is reminiscent of indie graphic novels and manga-inspired western illustration, and while that might not do it for you stylistically, the craftsmanship is unassailable. 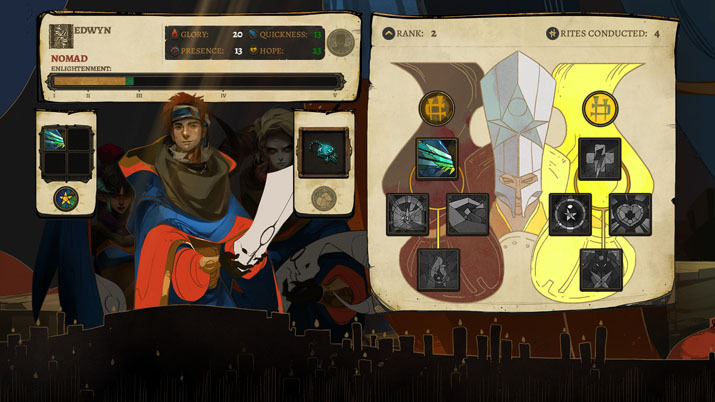 Of course, fans of Supergiant’s past titles might expect nothing less at this point, as their last two titles are likewise as visually charming. Still — even considering Supergiant’s already considerable track record — Pyre stands out, resplendent. The audio, too, is superb — another house special of Supergiant’s. Perhaps even more than the visuals, the sound of Pyre helps the world to come alive. It’s just a few elements: music, vocals, and effects — all of which blend together to make the experience rich. The music is a mix of eclectic tracks that evokes the feeling of wistfulness you might expect from a realm of exiles like Pyre’s desolate locale, the Downside, as well as amped, static-crackling excitement, such as when you face off against your opponents for your chance at freedom during the Rites. The vocals also contribute to this, in their own way. Your party doesn't speak their lines so much as intone them with short quips in a kind of made-up pseudo language, giving you the emotional context and inflection of their conversations as they appear in a text window below; the effect is reminiscent of a visual novel. This is true for all vocals, save those of announcer of the Rites, who speaks clearly and well. His disdainful jeers and commentary are so in contrast to the other speech within the game that you instantly realize, from the very first Rite, that you’re about to experience something new and exciting. The narrator’s uniqueness and personality shine through and make him one of the stars of the show, so to speak, capping off the killer soundtrack. I would be remiss not to mention the attention to detail paid the subtler sound effects, however. The little things: the trundling of cart wheels, the whisper of the wind, and other background noises, are all just as finely crafted as the rest of the soundtrack. These little touches were not necessary, to be sure, but they emphasize Supergiant’s attention to detail and fine polishing with Pyre. It’s the final sensory straw in the package, and it helps cement the title’s position as an immersive masterwork. The primary mechanical conceit is, in a word, simple; however, the execution is strikingly nuanced. At its core, Pyre is a mixture of basketball, dodgeball [EN: Oh, memories], and tag with your characters, trying to bring a mystical star ball into the opposing pyre in order to extinguish it. You can only move one character at a time, and once you pick up the ball, switching characters will pass the ball to the character you take control of. This would be essentially a trivial matter if this were ordinary basketball, but it isn’t, and holding the ball causes the character you control to forego their ability to tag opponents out. You see, when a character doesn’t have the ball, they have an aura, varying in size depending on their stats, and if they can touch an opponent with this aura, that opponent is tagged out. Opponents so removed are out of play for a few seconds, allowing you precious time to score. Still, simple, but it goes a bit deeper: each character has a different aura size, with small, fast ones usually carrying a rather small aura, while bruisers project large, area-denying auras. And this is where the dodgeball part comes in; to ensure that these zoning auras don’t completely block off the field, each character also has a manner in which they can channel their aura outwards like a projectile, thereby allowing even characters with small auras to threaten those with large, zoning auras, as a hit single hit is good enough to banish an opponent. Beyond this, each individual character has an unexpected level of available customization. Each character can carry an item into the Rites, and these have a wide variety of effects, from stat buffs to special abilities. What’s more, leveling up your characters lets you change the way they play, sometimes drastically. Add to that the fact that different characters use their auras and move very differently, and that story elements will occasionally give you interesting constraints to work with, and the true strategic depth Pyre offers becomes apparent, and it only deepens as the campaign goes on. 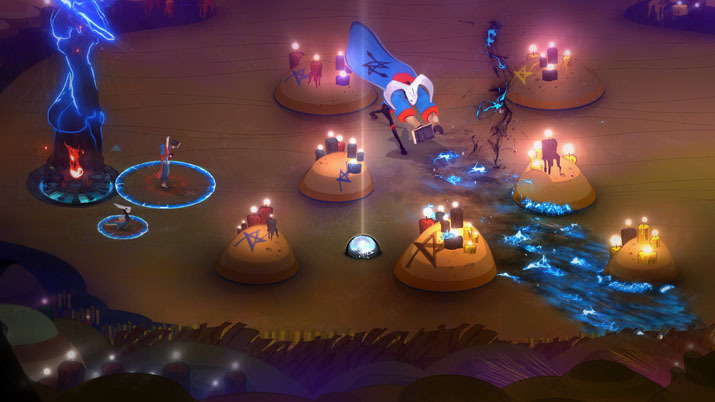 I keep mentioning Pyre’s campaign while talking about the mechanics of the Rites, but considering the campaign’s depth, the sport of the Rite is actually a comparatively small portion of things. Much the time spent in the campaign you are actually engaged in a kind of ‘visual novel’-meets-‘sports team management sim.’ In the context of the narrative, you guide the team as a “reader,” but this just means you decide where the group travels, making occasionally tough choices about where to stop, which path is best to take, or what trinkets to buy and sell. These segments can be viewed as interludes to enjoy the art and revel in the story and characters between the tense highs and lows of the demanding Rites. That those highs and lows are tangible and palpable as you scramble to overcome opponents at times is a testament to the AI programming, but that’s an examination I’ve neither qualification nor room in this review to make. There is a great deal to talk about with Pyre. I could easily double the length of this review and still find some things to argue, but, for now, I’ll let it be enough to say that gamers will talk about Pyre for a good while. Vivid visuals pair well with energizing audio, and both complement the subtle, mechanical gameplay; Pyre, a stunning package,provides with aplomb a depth of strategy not found in some AAA titles, and couches the experience in an engrossing narrative. Supergiant Games’ strongest showing to date, Pyre is a must play, a delight that can’t be recommended highly enough.